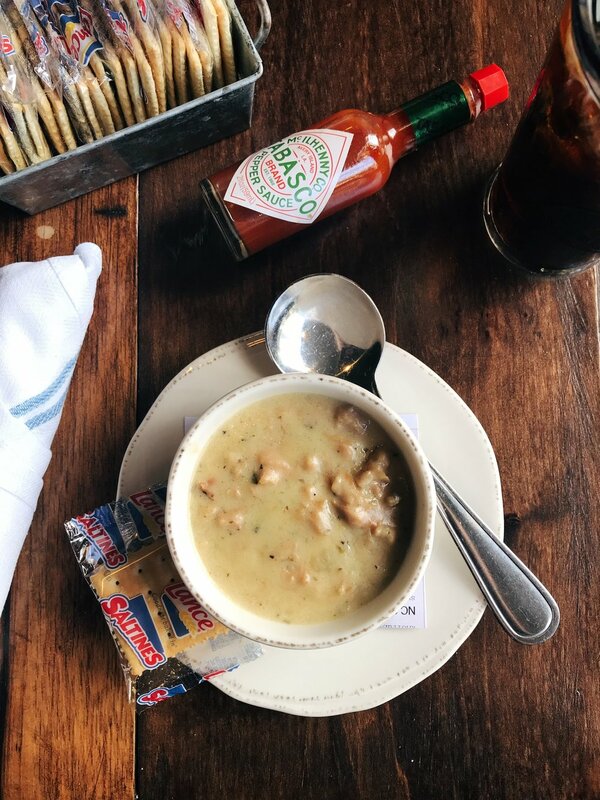 It’s no secret that Charlotteans love Clam Chowder! In fact, we have Guests who come in just to enjoy a cup or bowl of chowder because they had a craving they had to satisfy. There are a few regional versions of clam chowder including a tomato-base and a broth-base, but we prefer classic, New-England style. Rich and creamy with thick chunks of potatoes and a hearty helping of fresh clams. Just last week, Chef Brett was asked to visit WBTV’s Morning Break and share our recipe so viewers could make a batch for the “Big Game”. The batch size made on-air feeds about 10-12 people, but you can always halve the recipe for a smaller crowd. If you’re not a fan of cooking, never fear! We’ll still be serving up this classic in our restaurant during both lunch and dinner. PLUS, you can get a FREE cup of chowder just by signing up for our mailing list. 1. Heat large stock pot on medium heat. When hot, add oil, onion and celery. Cook until translucent but not caramelized. 2. Add sherry vinegar and white wine, then let reduce by half. 3. Add chopped butter and melt, when melted add flour and mix to absorb flour entirely. 4. Add potatoes, heavy cream, clam juice, thyme, salt, and pepper. Cook until potatoes are slightly softened. 5. Lower heat and continue to cook for 15 minutes. 6. When soup has thickened, remove from heat, cool slightly. Stir in chopped clams and parsley. Sign up with your email address to receive news and updates from Sea Level NC.